Losavio FA, Lucchini M, De Fino C, Mirabella M, Nociti V.
Transient hair loss during treatment with dimethyl-fumarate for multiple sclerosis. Mult Scler Relat Disord. 2016 ;7:68-9. INTRODUCTION:Dimethyl-fumarate is a recently approved drug for relapsing-remitting Multiple Sclerosis in Italy. CLINICAL CASE:A 55-year-old woman started therapy with dimethyl-fumarate on June 2014; it was well-tolerated aside from moderate flushing. Starting September 2014 she noticed a progressive hair loss, that neither the dermatological examination nor clinical and medical history nor blood investigations could explain. The hair loss slowed down after two months and was followed by a hair growth back. DISCUSSION:Transient hair loss is not a reported side effect of dimethyl-fumarate therapy but by excluding any known cause we attributed it to the beginning of the new therapy. I'm on DMF and not had any hair loss. I do take a small amount of d-Biotin 1,000ug daily. 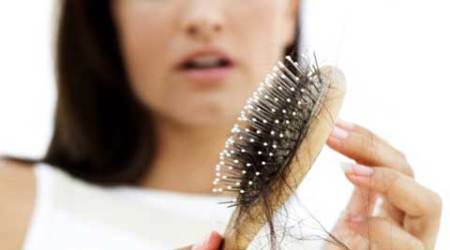 Biotin is known to support hair maintenance. In 2013 I did have severe hair loss with five days of oral steroids, it grow back and took around six months. Haha…I love this post. I complained of hair loss after starting Tecfidera and no one believed me. It thankfully slowed down after a few months. I too started shedding hair after starting Tecfidera. I put it down to 'stress'. I think should be included in the listed side effects of DMF. I wasn't on anything and my hair has been falling out. All dividing cells in the body? That sounds a bit unnerving. There are quite a few reports of this on the tecfidera Facebook page. Before I started DMF I did search re hair loss as I have quite long hair and was worried about it. There are quite a few people on various blogs saying that they have had hair thinning. I think my rate of hair loss has increased, about double the amount in the hairbrush each day and my hair is a bit thinner. Same happened with inteferon. I experience hair shedding while on Aubagio. Noticed it around the 5th month. The side effect is a documented one. I found an obscure blog entry somewhere referring to high dose biotin as a means to reverse the hair fall. 5000 micrograms daily, within a month noticed the hair shedding abating. Within a bout two months, everything was normal. I had no hair loss. Right after I ramped up to the full dosage I began getting brutal headaches. Hospitalized me in fact. Gave me a morphine push, helped for an hour. Occipital neuralgia apparently. Baclofen now. Hard to fight the feeling of tiredness with it. Considering getting the injections stop it. I started noticing hair loss a few months after starting tecfidera (and another few months on again it's not abating). When I mentioned to my MS nurse she said I wasn't the only one of her patients to experience it. There are many forum posts on the various websites from people with a similar story. I suppose it takes more people reporting to Biogen for them to acknowledge that this is a recognised side-effect of the treatment. This is shocking to me as i am on DMF for a long time and i never thought that this can be cause of my hair loss. I started getting severe hair loss about 2 months after starting Tecfidera. My hair is so thin now. Comes out in fistful when brush.